Adventure Time with Finn and Jake! Cartoon Network is releasing their newest cartoon in about a month or so and the commercials and marketing technique has caught my attention. The commercials feature a real life kid running around dressed up like Finn in the cartoon yelling, "What time is it?" The commercials got me looking into the cartoon a bit more and theres something about it that clicks with me. I've always wanted to see more stuff in the cartoon world with a more epic feel to it. Adventure Time appears to have that epic feel yet stay true to the cartoon nature of things. It doesn't really look serious, but maintains that balance of humor and adventure. I'm pretty eager to see how the cartoon is and look forward to enjoying the quirky storylines. If anything the art is very unique and fun. We'll see! Life sometimes throws you on a traumatizing roller coaster ride where you find yourself in gut wrenching descensions and temporary highs. I find that these often draw out emotions that definitely affect my art and creative energy. Especially with my preferred style and themes, I feel like I have to be in a content or joyful state in order to "create." But I've been pushing myself to express my creative energy even in times where there may be no joy, and the results have been interesting. With The Nosco Project, I have had a slight motivation to draw due to the publishing dates and below are a few months worth of catch up. May we always find the strength and courage to stand up and do what we are blessed to do regardless of the snakes and tangles that strive to make us fall. Following the previous post, here is an even better example of what it means to capture the bare essence of things. Of course this makes the assumption that these superheroes are well known. Looks like all it takes are 12 colored pixels for many of us to recognize superheroes. One of the more challenging, but satisfying things that I like doing is capturing the simple. In everything, whether it be a design, a face, an object or location, there is always an "essence" that makes up the core qualities. This "essence" is absolutely necessary in making this design, face, or object what it is. Sometimes in art, I find those that are able to capture this in their art are able to cut away all the useless details and waste in their work. Its amazing how much can be conveyed with just a few strokes, or choice colors. Once this "essence" is determined or captured, everything else becomes unnecessary. If all this makes no sense, I completely understand. I barely understand myself most of the time. 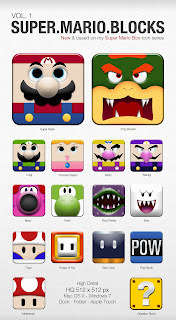 Below is an example of how using the same block shape for icons, the artist was able to capture the key qualities and colors that make up the character despite the limitations of shape. They probably could've simplified it even more, but this is cool regardless. The first theme for The Nosco Project was Goliath. Not too sure how I came up with that, but it turned out to be a fun theme to start with. When doing these theme pieces, I usually go with my first impression of the theme. The first image, or first idea that pops in my head, I like to stick with and kind of play around with it. When I started to work on Goliath, I just kept imagining an image from Hercules, the Disney version. So I went with that. Also I always like incorporating a new style so that it just forces me to improve on my use of the programs I draw with and also to challenge my creativity a bit. For this piece I tried out the style of using non-black borders for the shaping. For more awesome interpretations of Goliath...come and get to know TheNoscoProject! After years of admiring the Drawergeeks website, I've decided to start up my own project. Working with some close friends and going by an invite only system, hopefully this will be fun for those involved as it will be for me. The goal is simple. To inspire, improve, encourage, and enjoy. Looking forward to seeing how this project develops and grows!